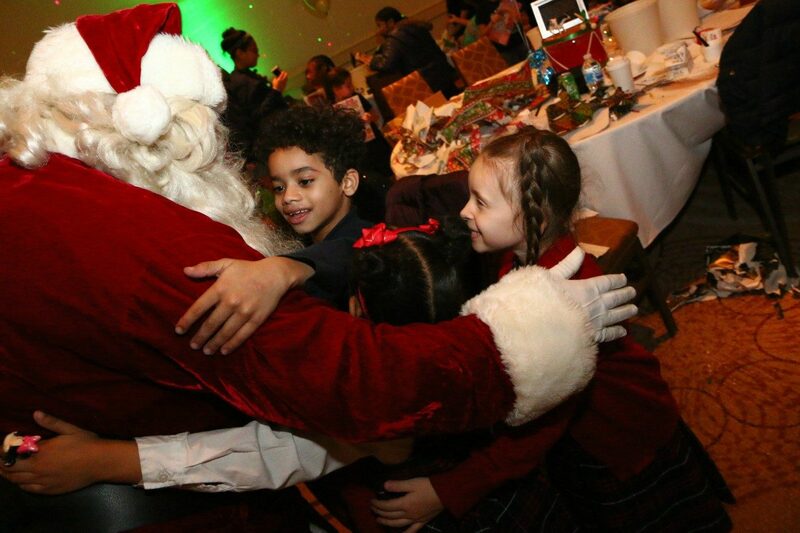 With a new name but the same generous Christmas spirit, the 62nd annual Archbishop’s Gala for Children was held Thursday, Dec. 21 in Philadelphia. The tradition of hosting a Christmas party for children in the region served by Catholic agencies was started by Cardinal John F. O’Hara and continues to this day under Archbishop Charles J. Chaput. The event highlights the work of the Catholic Charities Appeal to gather funds that support the work of archdiocesan Catholic Social Services. The party was originally attended by children of the network of child-care institutions for at-risk children that the Philadelphia Archdiocese then conducted but which no longer exist. Today most such children remain with their family in the community but in areas of poverty the needs still exist, and the needs of some 16,000 children throughout the year are being met by Catholic Social Services’ programs. As has been the custom for many years, the party was held at the Sheraton Philadelphia Downtown Hotel, directly across the street from the Archdiocesan Pastoral Center. 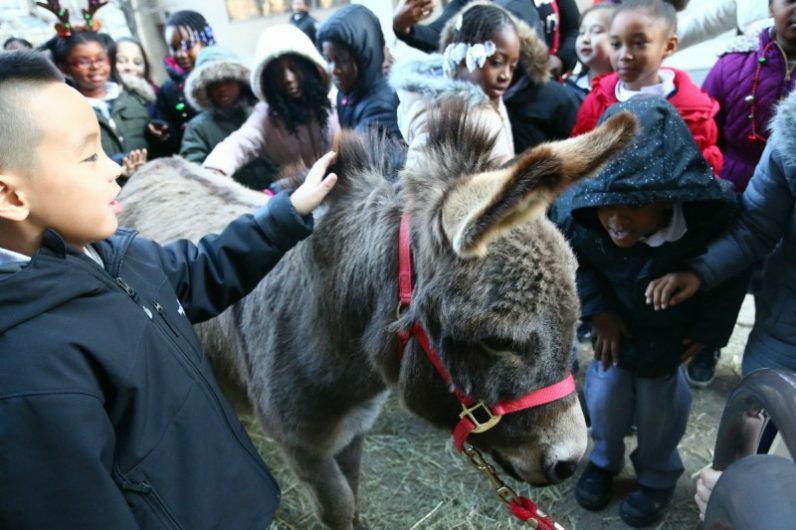 That is where the festivities began on a closed 17th Street with a live Nativity program featuring students from St. Raymond of Penafort School in Philadelphia. The supporting cast was a menagerie of live animals, including among others, sheep, chickens, ducks, a llama and even a very plump turkey. Being a North American fowl it is pretty certain there were no turkeys on hand for the First Noel, but Jesus came for the entire world. Seventh grader Jaida Stern, who was the narrator for the play, hopes to be an actress when she grows up. Across the street at the hotel, the 550 young guests were greeted by Archbishop Chaput and serenaded by carolers from St. Charles Borromeo Parish in Philadelphia, amidst a carnival atmosphere of smiling clowns and even a stilt walker, before heading upstairs to the ballroom. Emcee for the event was Father Chris Walsh, pastor of St. Raymond of Penafort, and the go-to ringmaster for all sorts of archdiocesan occasions. The theme of the program was “The Little Drummer Boy,” and talent included the All-Catholic Jazz Band, the Dynamic Elite Spirit Dancers, singer Kamal Bostic-Smith, Divine Mercy Parish Praise Dancers from DePaul School, the St. Athanasius Choir and students from St. Raymond parish with another Nativity play. The real star of the show came toward the end. That was Santa Claus, who for most of the year masquerades as a mere mortal, Douglas Dunn, a theology teacher at Pope John Paul II High School. He has been donning the red suit for this party for 25 years. Every child attending the party received a present to open, and the kids’ excitement was perhaps one reason the adults organize this party every year. “This was amazing,” said Nyair, who received a toy truck. Tanya, who received a doll, was also ecstatic. So how was the party on a scale of one to 10? “It was a 12,” said Jackie Delaney, who was in her ninth year as chair for the party. That’s a consensus assessment of everyone involved in this special Christmas event.